This reading is for a middle-aged man who has been unable to find a life partner, or even get past a couple of dates—despite being on internet dating sites for many years. His mother passed away two years earlier. It’s obvious this spread is imbalanced, due to all of the cards being in the Water (heart) element: RESOLUTION, CONNECTION, INTUITION, and SURRENDER. Note the complete absence of the other elements: Earth (body/material), Air (mind/thinking), and Fire (spirit/action). Clearly, this issue is emotional for the Seeker. The imbalance in the heart area suggests not just the problem but also the solution. The first card, RESOLUTION, is about unresolved issues between the seeker and his mother. The card shows a very young girl hugging her father’s giant leg. In this case, the genders of the figures in the artwork are interpreted in reverse. * The parents divorced when the seeker was a boy. His father abandoned him for a new family, while his mother depended on him emotionally and put unfair, possessive demands on him from an early age. The Resolution card suggests that, though the seeker has explored this past issue, he has yet to put it behind him. Clinging to the past has prevented him from getting more than two dates with any of his prospects. Echoing the main question is the CONNECTION card. It’s a hopeful sign! The card shows a male angel carrying a human woman across the world. One fear is that the seeker will be stuck with someone as possessive and suffocating as his mother. The Oracle’s guidance is to focus on the give and take in a relationship—in this case, what the Seeker would like to have and what he is willing to give. The Connection card helps the Seeker become aware of his own smothering tendencies and how he has unconsciously pushed away any prospective mate. 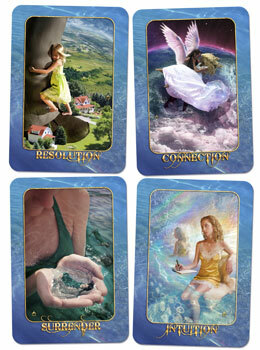 The INTUITION card suggests listening to that small, quiet inner voice. Though he’s been “drowning” in anguish over love, he’s been trying to rationalize, reason, and think his way through, instead of putting his hunches first. Finally, the SURRENDER card is a sign that he’s been trying to force a solution or “push the river” to find a mate. Love is an intuitive, spontaneous state. It may be time to give the dating quest a break and turn his focus to other issues. The absence of cards in Fire, Earth, and Air elements points to areas of life that need attention. In the reading, the Seeker began to explore spirit/action, possessions/health, and mind/knowledge—again, a hopeful outcome! * Just because the seeker is male doesn’t mean the genders in the artwork are always or automatically reversed. Each seeker and reading has its own reality. Use your intuition, ask questions, and the interpretation will become clear.